The Betsie Current Volume 4 Issue 1: On Shelves Now! Beginning another season of a job we truly love doing. 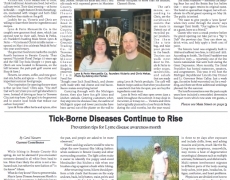 Jordan likes to say that we “aren’t burdened by reporting the news” — there already is The Benzie County Record Patriot, which, with one full-time reporter, tries its best to cover all the boring-but-important township meetings, zoning ordinances, obituaries, high school athletics, and such. 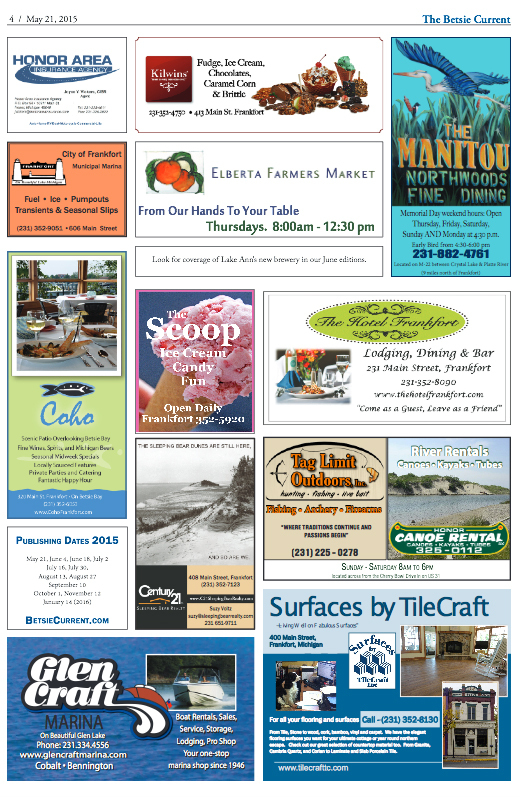 So we get to report on the fun stuff, like the cool people, places, and events that make Benzie County so special. In that way, it’s something that both tourists and locals can get behind, which adds to the appeal from the perspective of the business owners who advertise with us. Me though? I like to sum it up as a “feel good” newspaper, because it’s all goodnews news that’s contained within, never anything to make you feel glum. Suffice to say that we’re pretty proud of it, and I’m always happy to deliver it. The best part, though, is when people are happy to have it delivered. Seriously though, it feels good to be part of a product that is so beloved by the people in our community. It’s only the beginning of my second season with The Current, but it’s something that I hope we can continue to grow and build on for many years to come. For now, you can check out the first edition of this new season online here. 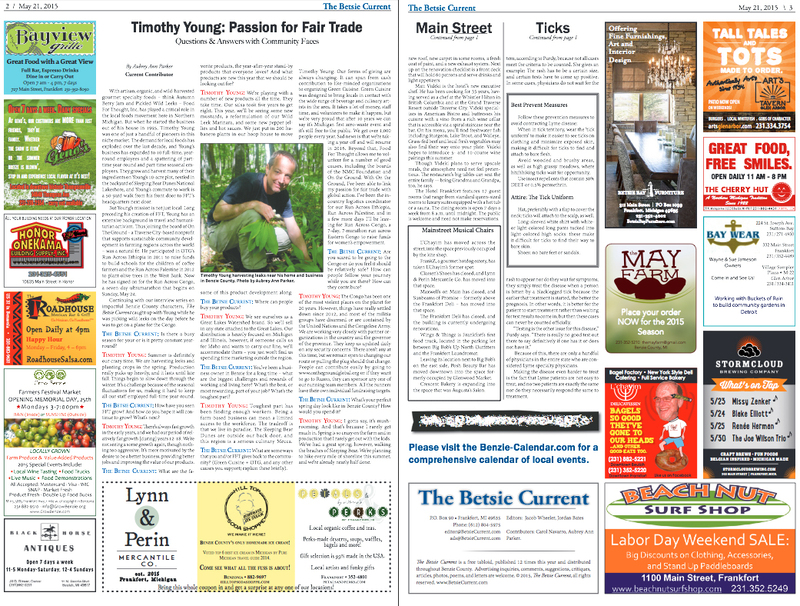 Or, better yet, find the hard copy on the shelf of almost any business in Benzie County. 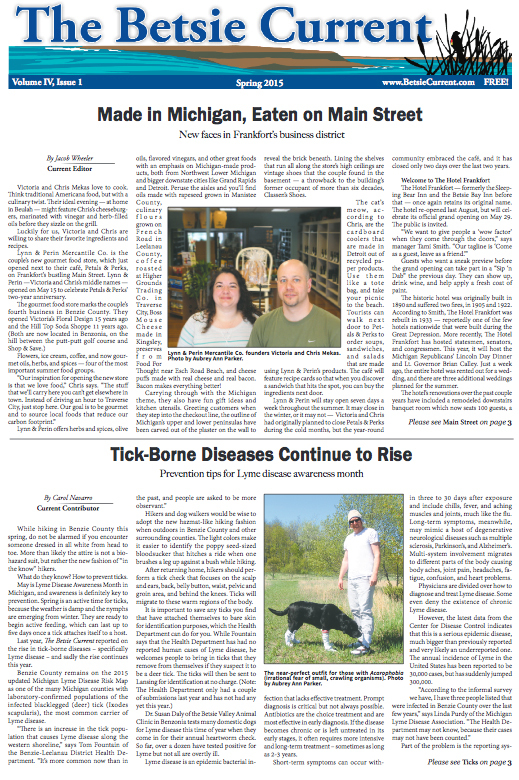 You’ll find an article on the new businesses in Frankfort by Jacob, an update on ticks in the region by family friend Carol Navarro, and a Q&A that I did with Timothy Young of Food For Thought, Inc. and On The Ground about picking wild leeks and participating in the Run Across Congo, which starts on Sunday. Additionally, I took all the photos featured in this edition. Want to advertise with us? Check out our ad rates here; email ads@betsiecurrent.com or call 612-804-5975 and ask for Jacob (pronounced with a “y,” like “Yah-cobe”). I’d love to hear what you think of The Current, too! And/or if you have any story ideas of what we should be covering. Comment below or send a tweet to @aubreyannparker.